Updated January 5, 2017 at 7:00 pm: Information has been added about Presto sales within TTC subway stations. See the end of the article. Still to be worked out is the actual final date beyond which any tokens or tickets bought in 2017 can be used or redeemed. With the TTC Board committed to a fare freeze in 2018 (election year) the old media won’t expire on their own, and of course tokens are always good for “one fare”, whatever it may be. For now, Metropass users should remain on the “legacy” cards until the same functions and pricing are available through Presto. An important part of the sales process is that riders who are entitled to concession fares will be able to buy cards with that option pre-loaded. However, there is a potential conflict with the TTC’s intended implementation of discount fares that could complicate this type of purchase and account setup. For a few classes of rider, the TTC proposes that a “Photo ID” be available. This would not be a separate card as in the early days of the Metropass, but a photo integrated into the user’s Presto card and account. The exact mechanism for loading this photo have yet to be determined. Also, it is not yet certain that photos will be required for seniors because, unlike children and students, their eligibility never expires, and linking the card to the rider for fraud prevention is less of an issue. One side effect the TTC did not mention is that a return to photo ID makes the card non-transferable, and this would produce limitations on its use that do not exist with current media. 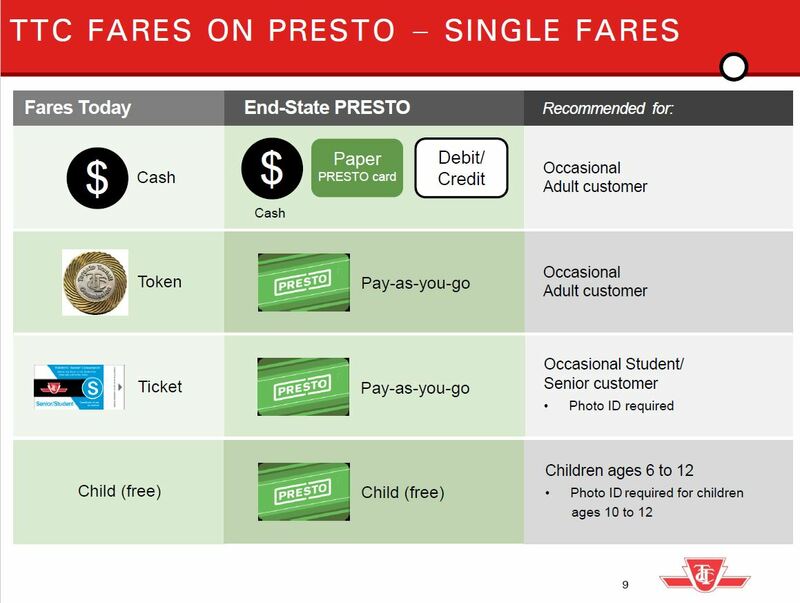 There have been many questions about how Presto will work for the several fare types now in use. The charts below are taken from the presentation at the TTC Board meeting of December 20, 2016. The daily and weekly passes will be replaced with a “loyalty” fare cap so that a rider who does not have a monthly pass loaded on their card would be charged no more than the “equivalent to pass” fare per day or per week. For example, the Day Pass is worth the same as four tokens, and so riders would not be charged more than four fares in one day. Similarly, the weekly charge would be no more than the value of a weekly pass. This will give the benefit of passes without the need to actually buy one in advance. There is no word yet on how the “Family Pass” for weekends and holidays will work. Premium fare services are simply a different class of Monthly Pass that would be loaded onto a Presto card as an add-on to the regular monthly pass. One class of fares has come up often in the lead-up to conversion. Many agencies give away tokens and tickets to their clients, and with the disappearance of legacy media they will need an alternative. This will be handled with single use Presto cards. There is no date announced yet for when these will be available. The review included improving cellular network connectivity, refining the monitoring system, checking validator performance and reviewing first line maintenance processes performed by the TTC. A recent field check of all surface vehicles showed that overall validator availability is now consistently over 98%. Once into steady state next year, the goal is to be over 99%. With a daily tap volume in the millions, even 99.9% would leave a few thousand transactions every day that could not be properly handled. To the basic reliability issues must be added logic issues related to calculating which taps actually constitute a “linked trip” and therefore should only incur one fare. This brings us to the knotty issue of transfer rules versus time-based fares where a rider would get a fixed time (two hours, for example) before a second fare was charged. This functionality is already on Presto for other GTHA systems, but is not enabled on the TTC. When transferring between 501 Queen streetcars and buses using PRESTO, do not tap onto the next vehicle when boarding. In other words, a year-long route change will use a non-standard protocol for handling transfers rather than having appropriate logic built into the Presto system. The TTC Board has dragged its heels on a move to time-based transfers citing the estimated $20 million “cost” of lost revenue based on the premise that about 4% of riders would make a second trip “free” within the two-hour window. They have not considered the convenience factor, the simplicity of verifying whether another fare is due, or the cost and annoyance of resolving disputes where Presto overcharges riders. This can occur not only through GPS errors, but also by transfers at non-standard locations such as short turns and diversions. Problems with the Presto fare load machines are supposed to be fixed with the introduction of replacement units early in 2017. Although Presto is a Metrolinx product, riders see this as a TTC issue because they are at the front lines. TTC staff are responsible for first level support of both the Presto equipment and the new fare gates under contract arrangements with the respective vendors. This simplifies and consolidates basic support, but with the teething problems of both systems, this drops a lot of work in the TTC’s lap. There are no published stats yet on the speed with which failing machines are repaired or the responsiveness of the various groups responsible. Metrolinx plans to roll out upgraded Presto fare vending machines early in 2017. Early complaints about these were fobbed off with the claim that the TTC was an unusual operating environment, but similar problems have been reported with these machines in GO Transit locations as well. More recently, there are tales of mismatches between customer behaviour and the expectations of software on the machines. That is a classic design problem, and one has to wonder how such machines made it out of the shop. The 70 machines are heavily used and perform 35-40,000 loads per week. A custom designed machine, it is not meeting reliability targets and causing challenges for customers. Metrolinx has escalated concerns to the suppliers who are working to resolve the issues. The second generation machines are now in testing and are expected to be significantly improved. The current machines will be replaced with the new generation machines early next year. “Open Payment” with the ability to use non-Presto cards as identification for charging transit fares. When the TYSSE (Line 1 Spadina extension to Vaughan) opens at the end of 2017, the stations will already be configured for a “Presto” world, and legacy fares will only be accepted by a transitional arrangement until they are phased out. Cash fares will be handled as an option by the fare vending machines which will issue single-use Presto cards. The point about Open Payment goes beyond simply accepting a credit card (something Presto can do already for single adult fares) to a fundamental change in how Presto works. Today, all of the fare transaction takes place between the Presto card and reader on a vehicle or in a station. The activity is reconciled to a central system on a daily basis. This will bring Presto into line with the concept the TTC proposed many years ago before Queen’s Park forced them to adopt Presto as a condition for continued receipt of gas tax revenue. 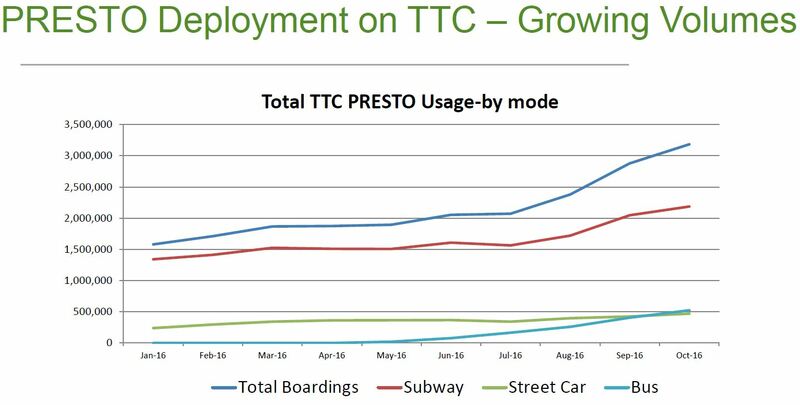 Presto usage on the TTC remains relatively low, although the volume of “taps” looks impressive beside activity on other systems within the GTHA. Only 5.1% of TTC rides are taken with Presto. This is unsurprising considering that over 60% of fares are paid with Metropasses, and some concession fares are still not available via Presto. To put this into context, the TTC carries about 1.8 million rides every day and the “unlinked” trip count roughly doubles this number. (This counts each leg of a journey as a separate transaction, a Presto “tap”, and, on average, each rider transfers once). The monthly volume shown above is in the same range as the daily volume a full roll out on the TTC will bring. In the comment thread, an issue arose regarding service charges by Gateway News outlets selling Presto cards in the TTC subway, and more generally about why the cards were no longer available from TTC vending machines. I asked both the TTC and Metrolinx about this, and here are their replies. Why are PRESTO cards are no longer available in TTC Pass Vending Machines? There are more Gateway Newstands locations to sell PRESTO cards than there are TTC Pass Vending Machines. As a result the decision was made to expand PRESTO card sales at Gateways instead of using PVMs as a sales channel. Acquiring more PVMs would have been cost prohibitive, especially since each station entrance will have a Fare Media Vending Device available when the PRESTO rollout is complete. Would it be correct then to say that during the interim until FVMs are available the only way to buy a Presto card in the subway will be at Gateway? Yes that is correct. More Gateway locations will be added over the coming weeks until all stations that have a Gateway will be selling the cards. Every business in Canada pays a transactional fee to the bank when a customer makes any purchase with a debit or credit card. There are many ways businesses recover these costs. In some cases for smaller businesses, such as the individually operated Gateway franchises, they charge a fee to the customer to recover these costs which the customer approves after they insert their card in the payment terminal. Every Gateway Newstands location is individually owned and operated and each owner determines and sets the fees they may or may not charge for any credit and debit transactions to recover the bank fees. That is solely the retailers decision and unfortunately outside of our control. Gateway may have further information. Customers can also order cards online, at GO stations (such as in York Concourse) or at UP Express at Union, and we will be announcing an expansion soon with a major retailer. And so the combined answer, dear readers, is that the TTC has stopped supporting Presto sales even through its existing fare machines, but meanwhile Metrolinx has no control over any surcharges Gateway might impose. Why the TTC could not simply handle these sales through its own Station Collectors for the year’s transition period is a complete mystery. This is a spectacular example of failed “Customer Service” when the only goal is to say “people can buy Presto cards everywhere”. Both the TTC and Metrolinx should be ashamed of themselves, but I’m sure there are still a few photo ops to be had for the Mayor and Minister on this one, and that’s all that matters. For those who are following this article via comment feeds, there has been an update with information about surcharges by Gateway News outlets on the sale of Presto cards at subway stations. I have a question or two regarding TTC transfers, and this is as close as I can come to being topical in a recent post. My first question involves post transfer directionality: If I’m apprehended with a valid, time wise, transfer, while going toward my original embarkation point, will I pay a fine? Steve: Maybe depending on whether you have a legit explanation. For example, one might start on the Danforth subway at Pape, ride west to Yonge, south to King and then east to, say, Sherbourne. It would be a valid explanation that staying on the subway rather than using the at times infrequent Sherbourne bus is the better route, if not exactly direct. If I’m a suspected joy rider [I know this concept will puzzle many], taking a less than efficient route, but still within two hours, will I pay a fine? Steve: That depends on what is a “less efficient route”. See my comment above. It can easily be argued that the shortest path is not necessarily the quickest. Lastly [this wouldn’t be me of course], what would prevent any TTC loving rider from picking up a few transfers at two hour intervals, from well chosen subway machines, to pull an MTA; at least until 1:00 AM? Steve: Nothing, except that “taking transfers” will not be possible once all fare receipts take the form of a Presto ticket or card, or, thinking of streetcars, a receipt taken from a machine that issues them in response to payment. Subway transfers as we know them will disappear. For a truly integrated system, the only thing which would make sense would be to divide the GTA into zones, where the City of Toronto would be one zone (as it is for TTC customers at the moment). This means that fares should be zone-determined and thus transit agency-agnostic (as is the case in many if not most of the integrated fare systems in the world – at least in all of the ones I’ve had the opportunity to use). I have been saying basically this for years now, and haven’t even updated the page I referenced since May 2012, and that change was only to refer to an example in the past tense since the operation had changed. Thanks for following up. You’re completely right; this is a spectacular example of failed customer service. I did a bit more digging, and apparently it’s against (nearly) all merchant agreements with Moneris etc. to apply a surcharge on regular transactions in their primary channel for credit card transactions (i.e. it’s prohibited for a retail store to charge a fee a customer wishing to pay with VISA/MC in-store, but if they set up an online shop the merchant would be able to charge a fee to customers transacting online. This is called a “convenience fee” in the industry and is the only way vendors can apply a surcharge.). If Moneris caught wind of Gateway charging transit riders to purchase a PRESTO card, there could be penalties for the merchant. So did any of the stores that sold TTC fares (tickets, passes) add a surcharge if paying by credit card? Or did the TTC wisely prohibit that practice? Some mom and pop stores charge a “user fee” to use a credit or debit card for any purchase. The big no-no for us is charging you more for fare than we sell it for. We cannot dictate user fees stores impose for debit/credit. What they can’t do, if they’re an authorized seller, is charge more for the fare media itself. Meh. Brad Ross talks about “fare” and “fare media” as if they’re interchangeable. I would think that the $6 Presto card itself would be a fare “medium” while the recharge of $10 or whatever is the “fare”. As for the $6 for the card, I think that will be re-examined when the Presto rollout goes from early adopters to forced adopters (i.e. current Metropass users). GO gave out the Presto cards for free when the two- and ten-ride tickets were phased out. I had to show, or possibly give them, my ten-ride GO ticket, and I got a Presto card for free. I expect something like this to happen when Metropasses finally go. Of course, there are a lot more Metropass users than there were ten-ride ticket users…. Has there been any discussion of when/if back door loading will be allowed on buses (says the guy who watches buses with not full back sections drive past him most mornings)? Steve: Yes there has, and the TTC does not plan to implement rear door loading on buses. Steve said: …the TTC does not plan to implement rear door loading on buses. The TTC works hard to give the impression that it’s the institutional equivalent of a brain dead patient kept alive only by a ventilator. Does anyone making these decisions have any passing knowledge or experience with how circulation in buses actually works (or doesn’t work)? Because of aisle widths and circulation impacts thereof, rear door loading (particularly on articulated buses) is needed even more than on streetcars. Wait, I’ve got an idea. Maybe we can encourage the TTC to implement 2-hour transfers and make up the lost revenue from the efficiencies of allowing rear door loading. Can’t hurt to at least propose it, and the pairing is just as logical as any TTC thinking I’ve encountered. I know… I know. Ross Trusler wrote: Wait, I’ve got an idea. Maybe we can encourage the TTC to implement 2-hour transfers and make up the lost revenue from the efficiencies of allowing rear door loading. This could also reduce the estimated loss from 2-hour transfers. With all-door loading, you have to move to a POP fare system instead of a pay-as-you-enter system. With time-based transfers, one must have a valid transfer for the entire journey (though fare inspectors usually allow some leeway, in my personal experience). With pay-as-you-enter fare collection, a transfer need only be valid at the time of showing it to the operator. If it has only one minute left, you are valid to enter even if the bus trip will take another hour or longer. 99.9% Presto reader reliability is unacceptable across all devices. That’s 1.44 minutes of downtime/device/day. A pretty huge number when you consider the thousands of Presto readers out there. With over 5000 readers out there, that’s over 120 hours of downtime/day. Suica in Japan has had 99.999% uptime pretty much since they started, almost 18 years ago. The five nines is something Presto should be shooting for. However, I don’t think it’s possible with the architecture they’ve chosen. Here’s a neat presentation about Suica from nearly 10 years ago. – After a tap I can’t keep walking at speed. I have to stutter step, or run into the plexiglass gates. 200ms response time would be much better. Leaving the station is equally ridiculous. – Once I tap, I have no idea what my card balance is. This is insane. – Gates are too narrow. The fare gates should be much lower (hip height of someone who is 5′,0″), they should have an LCD screen on top of the gate entry where you tap your card. The gate should open much faster. As you walk through there should be another LCD screen after the swinging gate that displays your balance. Vending machines are another disaster entirely. OK, so now I’m trying to figure out why every single bus in the line of 6 that came over the hill towards the waiting throng at my bus stop this morning has a Presto reader at the back. Admittedly, only 3 of the conga line of quite full buses had room at the back somebody could get in but if we are not supposed to use those back door readers when getting on, why are they there? Steve: Because some locations do use rear door loading, notably subway stations, but also some regular stops (with loaders). In theory you are supposed to tap onto a surface vehicle when transferring from the subway, but the TTC has not activated this yet because, quite obviously, there is no way to tap on to the subway going the other way. All of this is the BS confusion brought about by the failure to adopt something other than the current byzantine transfer rules. Steve writes: In theory you are supposed to tap onto a surface vehicle when transferring from the subway, but the TTC has not activated this yet because, quite obviously, there is no way to tap on to the subway going the other way. In a fare-paid loop? What’s next, tap on to Bloor trains after coming off Yonge? What a waste of electricity and computing power, even with the current transfer scheme. Unless fare by mode is on the way or they will start charging for transfers. Steve: This is the TTC we are talking about here. It’s all part of the scheme to make the subway a separate fare zone, an idea that appears to be on the back burner now. Steve: This issue (rear door loading) is one of many cases where the official line from TTC is hopelessly out of sync with the real world of their operations. Today I got on a 501L shuttle and both Presto readers were not in service. I transferred to a 44 Kipling South; the front reader was not in service and the rear reader was totally dead. I think I get, on average, one bus a week that has both readers out (one of two readers working is more common). I don’t think I ride that many buses, and I don’t always notice if the readers are working, as I use a Metropass. I really doubt if there’s consistent 98% availability of Presto readers. I would suggest that Metrolinx tout that “100% of available Presto readers are available!” Hard to argue with that. In Scarborough, the last place to get the readers, it seems, the readers are often out of service. At least once a day, one reader is out of service and 1-2 times a week BOTH readers are out of service. Today, I went to purchase a Presto card from the TTC agent at King and she advised I would need to go through the (pay-entry) turnstiles to go to the Gateway News and purchase a card. So in rush hour, you now need to go ask permission to enter for free to see the Gateway News stand, and are expected to pay a fare when done?? I can’t see many people doing that. Lost revenue from two hour transfers could be recouped from better logistics. I came here after googling the Gateway News surcharges. I am livid about these and the TTC doesn’t give a damn – they shrug it off that it’s up to the individual businesses to determine their fees. Metrolinx should have insisted that the vendor not impose added fees when the contracts were signed. Gateway News should be trying to make their money back from the added foot traffic at their kiosks. This is not okay! And I happen to be someone who makes a decent salary and lives somewhat comfortably. I can take the surcharge hit (but refused to on principal). This is not fair to vulnerable people and I can’t believe the TTC has let this Presto project become such a disaster. I also went to purchase a Presto card from a Gateway store in mid December and looked down at the terminal to see an extra 10% had been added to my total before entering my PIN. I refused to complete the transaction and later spoke with TTC management about it. I was told that the Gateway vendor relationship completely belongs to Metrolinx and that there was little they could do but pass along my frustration. Metrolinx could have easily made it a condition of their agreement that Gateway accept credit cards and add no supplementary fees to any Presto transactions. As the de facto exclusive sales agents for a public utility, Gateway’s open disregard of the terms of their merchant agreement reflects extremely poorly on the province and the city. It’s this kind of thing that sullies everyone’s reputation and sets up an even more hostile customer service environment. For those who only use TTC, currently have a Metropass, don’t use any other form of transit (GO, UP etc), why can’t the metropass system remain as is – eg a separate turnstile for metropass holders at subways, and no need to use the Presto machines on other ttc vehicles? 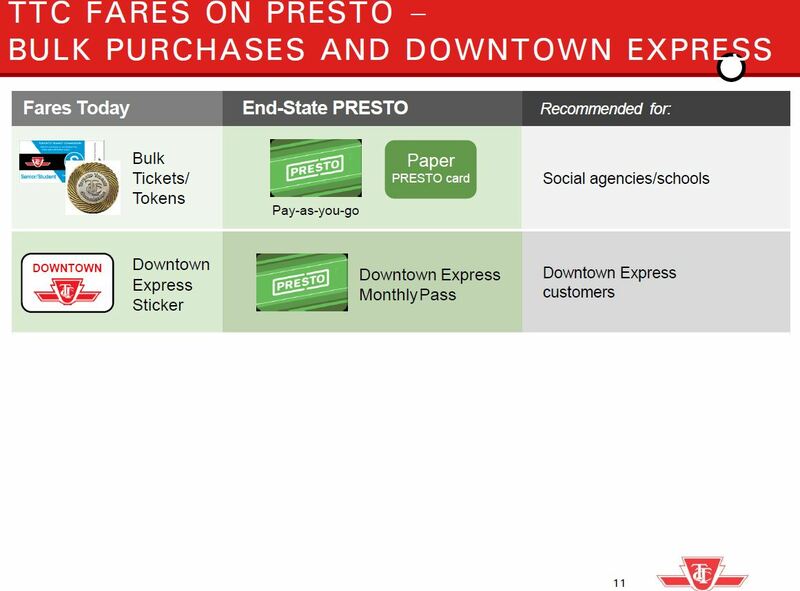 Steve: In theory, Presto will eventually be a stable reliable system, and the function of Metropasses will be available on that card. 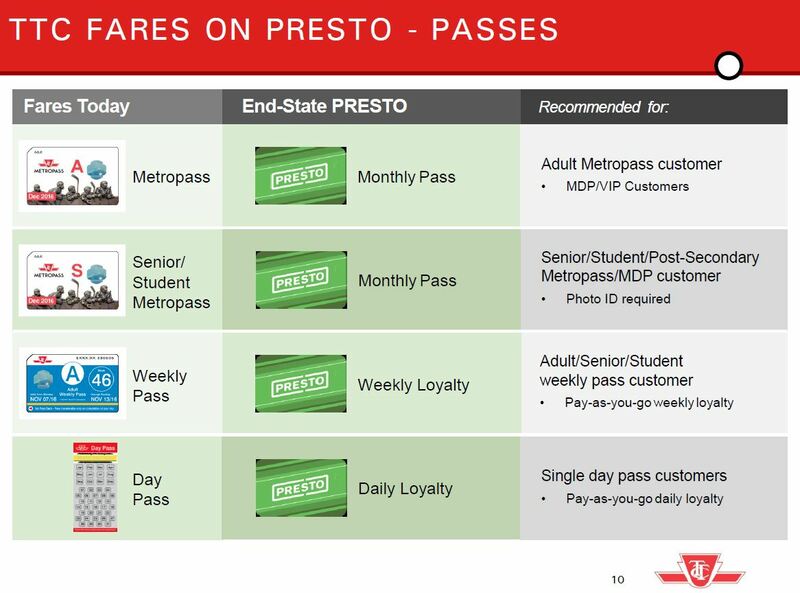 Presto already supports monthly passes elsewhere in the GTHA. The challenge will be getting Presto to an acceptable state able to handle the huge volume of transactions before getting rid of passes. That’s why the TTC recommends that pass users not shift to Presto yet. Of course, Queen’s Park cannot foist any kind of new “integrated” fare system on Toronto without a complete Presto conversion. There’s always the fun of entering a subway station with a Metropass. Ten Presto gates face you (used by basically no one) so you try to find the one gate that has a Metropass swipe. Or you walk through the open area by the collector (which used to have a turnstile, but that was so yesterday). Yeah, after putting up with the unreliability of Presto gates for over a month, I got fed up and sent an email to ttc’s Presto honcho, Lito Romano. IME of mainly using two stations for my commute, the four available gates with Metropass swipes are down ~50% of the time, last night both were down at my downtown station, no collector, no other means to gain access to the platform, as the collector gate was replaced with a permanent barricade. One of the gates at my suburban station, the large accessibility gate, is down ~80% of the time I pass through in the mornings. In fact, it is kept roped off most of the time. I suspect it is only being serviced once or twice a week. Clearly, Presto ain’t ready for prime time. Steve: A major problem with the Presto implementation is that the TTC is responsible for “first line” maintenance. There is no way of knowing if they just have not gotten around to it, or if they have handed the problem off to Presto’s team. Then there is the matter of the TTC Station Managers who are just about invisible. One would hope that they would be reporting outages like this even if there isn’t a collector to do so. Of course if the equipment breaks all of the time, staff get tired of phoning in again and again to report the same problem. Among all of the “key performance indicators” in Andy Byford’s monthly reports, there isn’t one that talks about fare system reliability. Steve: This does not explain gates that are routinely seen out of service for extended periods, nor the basic issue that a vandal could create a “free” station simply by jamming a gate. Byford said about the same a couple of months ago. This reminds me a lot of the “Why can’t sidewalks be machine ploughed in the (old) City areas? Because the sidewalks are too narrow.” No, it’s because the ploughs they bought (doubtless based on some US suburban standard) are too wide. Similarly, if the fare gates are too slow to open, this is not a problem with the passengers (uh, “customers”) who need to be “trained”. Rather, it’s obviously a problem with the gates that needs to be corrected. BTW, does anyone know the story of why some Prestocard fare gates display a grey-green WAIT sign in the entry direction while others display a bright green checkmark? Both work, and open at the same speed. My obvious thought was that the WAIT ones probably display a checkmark in the reverse (exit) direction, while the checkmark ones display the red X, and they can change on the fly based on traffic. But I checked at St Clair, and this is not the case. There is no correlation that I can see between the checkmark and WAIT ones and any status in the exit direction. Am I missing some other obvious explanation?